I’m willing to admit when I’m wrong. Especially when there’s evidence to offer correction. Last week, Mike Wise sought to convince readers not just that Washington Wizards president would receive a contract extension after the season, but that he deserves one. So, maybe I’m just being hard-headed. Maybe Grunfeld has been doing a just spiffy job and I’ve…missed it. Perhaps I’ve permitted bias to creep into my thinking and I’ve been unfair in my analysis of the Wizards and of Grunfeld’s work. So, using Cacciola’s article as a launch point, I’m going to take as objective a look as I can at the claims he makes in support of Grunfeld. After so much futility, after so much losing and after so much false hope, the Wizards have finally reinvented themselves as a relevant team — thriving, even, with an energetic nucleus that features Beal and John Wall, 23, a first-time All-Star whose ability to run the court is virtually unmatched in the N.B.A. The Wizards were 33-31 after Wednesday’s loss to the Charlotte Bobcats, in solid position for a playoff berth. The first difficulty in analyzing this passage is the use of glittery words that don’t have real meaning. “Relevant team” means what? There’s little doubt the Wizards will make the playoffs this season, but does anyone think they have a shot against either the Heat or the Pacers? Does anyone believe the Wizards would currently be sitting sixth in the West? They’re reasonably fun to watch, and it’ll be great to see them back in the postseason. But, relevant? Depends on what folks want it to mean, I guess. Cacciola identifies the “energetic nucleus” as being Bradley Beal and John Wall, which is something Wise did as well. To me, “nucleus” would suggest players who are currently the primary causes for the team winning. Wall fits that description, even if his production still falls well short of league elite status. But Beal? Maybe next year he’ll reach “nucleus” status. Perhaps the year after. This season, he’s fourth in total production (using the Player Production Average metric I developed), but the clear “nucleus” of the team this season is comprised of Wall, Trevor Ariza and Marcin Gortat. Perhaps Cacciola means that Beal and Wall will be the nucleus in the future, but that’s not what he wrote. The word “thriving” indicates something ongoing — something happening in the here and now. Patience is not a word frequently used in professional sports. Fans are impatient. Owners are impatient. Yet the quest to win now, and win by any means necessary, often turns out to be an ill-conceived approach, one that strips the team of long-term stability. This is kind of a logic trap because it asserts a problem and a conclusion without offering supporting evidence. People are impatient. Impatience is bad because it strips the team of long-term stability. Cacciola offers up the Knicks as an example, but there are some problems. First, an anecdote isn’t evidence. Second, even if he’d cited two or three examples, the plural of “anecdote” isn’t “evidence.” And third, he hasn’t shown that the Knicks’ problem is impatience. I’d argue it’s been incompetence. Cacciola seems to share Leonsis’s belief in The Continuity Theorem. The logic of the Theorem is this: hire a team (management, coaches, players), keep them together, give them time, and…voila…winner. The foundation of the Continuity Theorem is that continuity causes success. I think it’s wrong, though. Or, at least that it’s stated the wrong way around. That is to say: continuity doesn’t cause success, but rather success causes continuity. Let’s try a thought experiment. Imagine assembling a team of say Eric Maynor, Nick Young, Chris Singleton, Jan Vesely, Kevin Seraphin, Garrett Temple, Jordan Crawford, Cartier Martin, Trevor Booker, and Jason Collins. Let’s say that squad is coached by Randy Wittman. How long should we keep this group together to produce a winner? How long until it makes the playoffs? Wins a series? Reaches the Finals? The reason good teams have continuity is that they’re good. When a team has good players, it doesn’t want to make major personnel changes except for age, injury and expense. When a team has bad players, there must be turnover because the way to improve is to replace bad players with good ones. Now, if you have young players you believe in — AND they work hard — those players can transform themselves into good players. That’s the hope with Beal, Wall and Otto Porter. But, they don’t get better because they’ve been kept together, they get better because they work hard and smart and they mature. It’s been 17 seasons since the Spurs had a season that bad. I think it’s fair to say that Wizards fans have been patient. Grunfeld, 58, declined to discuss his tenure with the Knicks, preferring instead to talk about the Wizards, whom he joined in 2003. The Wizards made four straight playoff appearances starting in 2004-5, but then came the lean seasons — 19 wins in 2008-9, for example — as the team coped with injuries, off-the-court problems and an ownership change. 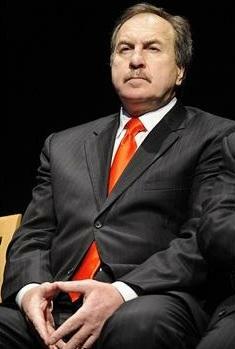 Still, Grunfeld survived when many others would have been fired. As for the ownership “change,” I’m not convinced it’s a major factor in Grunfeld’s execution of his responsibilities. Former owner Abe Pollin gave Grunfeld a “win now” instruction. He didn’t instruct Grunfeld to trade the fifth pick in the draft for Mike Miller and Randy Foye, and then let both walk as free agents. Pollin didn’t tell Grunfeld which players to draft or which free agents to pursue. He told Grunfeld to win. It was up to Grunfeld to figure out how to do it. What happened? Over a season and a half, they went 36-96 before saying “uncle” and trading away high-priced veterans. But hey, stability is good, right? Ted Leonsis, who became the majority owner in June 2010, told Grunfeld to rebuild the team through the draft, a goal that Leonsis knew would take time to achieve. Time is not an especially valued commodity in professional sports, but Leonsis was committed to using some. The process, as Grunfeld described it, started with Wall, a high-energy point guard who was the top overall pick in the 2010 draft. While Wall would be the team’s centerpiece, Grunfeld said he knew he needed to surround him with perimeter scorers who could space the floor. With that in mind, Grunfeld went through free agency to sign Martell Webster, a dependable 3-point shooter. Grunfeld also acquired center Nene in a three-way trade that sent Nick Young to the Los Angeles Clippers and JaVale McGee to the Denver Nuggets. Four months later, the Wizards drafted Beal. This is a curious mix of building on the unsupported Continuity Theorem, and selective omission of relevant information. Notice that there’s a key date missing — an entire year, in fact. That year: 2011, also known as a time when Washington was building through the draft and Grunfeld chose Jan Vesely, Chris Singleton and Shelvin Mack. As many have written countless times, after careful evaluation, analysis and thought, Grunfeld picked Vesely ahead of Kawhi Leonard and Kenneth Faried, chose Singleton over Faried; and then plucked Mack before Chandler Parsons and Isaiah Thomas. That’s not retroactive 20/20 hindsight stuff — there was an array of fans using publicly available information who said the Wizards were making mistakes at the time. What’s happened? Last season, Vesely was the league’s least productive PF. This season he’s better than that, but still not much above replacement level. And he’s in Denver, dealt there as part of the deal to bring in a 37-year old backup PG. Last season, Singleton was one of the NBA’s five least productive PFs. This year, he’s right at replacement level. Mack wasn’t anything outstanding, but a) was the most productive player the Wizards selected in 2011; and b) was showing some signs that he could become an acceptable (and cheap) backup PG. So, of course the Wizards cut him twice to keep less productive players. A previous draft analysis I did using PER suggested that Grunfeld was roughly average as a drafter. I’m planning a more extensive analysis later this year using PPA (which does a better job than PER of determining who wins and who loses in the NBA) — if I can find the time between responding to “All Hail Grunfeld!” articles. Today, the only players who remain from the team’s 23-win season in 2010-11 are Wall, Trevor Booker and Kevin Seraphin, who are all young and productive and understand their roles. This one is a puzzler. Wall and Booker can both be described as “young and productive,” but “productive” doesn’t work with Seraphin. Last season, Seraphin was the league’s least productive center. This year, he’s not quite as bad, but he’s still below replacement level. His strength is supposed to be scoring, but he’s had exactly one season with even average efficiency. He’s sort of a poor man’s Eddy Curry — the ball goes in the basket at a decent rate when he manages to shoot, but he’s a terrible passer and a turnover machine. He can be doubled with impunity because he’s more than twice as likely to turn it over than to assist a teammate. And he rebounds like a small forward. Grunfeld said he would continue to take a measured approach. He cited the slow upward arc of the Oklahoma City Thunder, who struggled to make much noise in Kevin Durant’s first few seasons in the league. Durant developed, and the Thunder picked up important pieces to supplement his skills. There was never any panic, only patience. “It doesn’t happen overnight,” Grunfeld said. Wall was the obvious pick at number one in 2010 just as Durant was the obvious pick at two (since Portland had already selected Greg Oden). Neither pick is indicative of basketball acumen — nearly anyone would have made the same choices. * — That was the year of the NBA’s labor dispute, which shortened the season. The Wizards won 20 games that season, but I’ve extrapolated to an 82-game season. ** — So far this season the Wizards have 33 wins. Their current winning percentage multiplied by 82 games comes to 42. Their scoring differential is that of a 42-43 win team. What I see in the table is that Wall was a tad better than Durant as a rookie, but that Durant improved much faster. Perhaps not coincidentally, Oklahoma City’s wins went up faster well. The first two seasons were similarly terrible for both teams, but then the Thunder jumped to 50 wins in Durant’s third season while the Wizards managed just 29 in Wall’s. Of course, Wall was injured for a significant chunk of his third season, but with him they were a game under .500. I won’t argue if folks prefer to claim 40-42 wins for that third season. The basic point still stands — namely, that OKC’s arc wasn’t “slow.” It was horizontal for two seasons and then turned sharply up. From Durant’s second season to his third, they more than doubled their win total. The Wizards’ arc has been slow, however. Since the Wizards were attempting to emulate the Thunder’s approach (building through the draft), it’s worth comparing what the teams did with their picks. In the three drafts following Durant’s, OKC added Russell Westbrook and Serge Ibaka in 2008, and James Harden in 2009. Their 2010 draft was a bust — they traded multiple first rounders and got essentially nothing in return. In the years following the selection of Wall, Seraphin and Booker, Grunfeld picked Vesely and Singleton in 2011, Beal in 2012, and Porter in 2013. Washington’s 2011 draft class will never be what the 2008 draft was for OKC. Beal’s first two seasons are a flatter version of Harden’s. The Wizards youngster had a rookie PPA of 92 and he’s currently at 94 in year two. Harden’s rookie season of 73 grew into a 101 (league average is 100) in his second year and jumped to 142 in his third. It’s way premature to make a call on Porter. The early returns don’t look favorable. That’s seven first round picks for the Wizards since 2010. Wall is good. Booker is solid. Beal will probably be well above average. Let’s give Porter an incomplete. What I see is a clear reason why the team has shifted from building through the draft to making trades for established veterans: the failed 2011 draft. It seems odd to tout the team’s young “core” while ignoring that they’ve been forced to trade for starters and construct a geriatric bench because they’ve drafted so badly. And, Cacciola omitted another piece of relevant information when assessing Grunfeld’s performance: the egregious free agent signing of Eric Maynor, who was given the full biannual exception and a player option on a second season despite four seasons of sub-par play in the NBA. Maynor, of course, was so bad in Washington that he had to be traded (along with Vesely AND a future second round pick) for the 37-year old Andre Miller. So, after careful reivew, I remain unpersuaded that Grunfeld has done a good job running the Washington Wizards. Maybe next week someone from the New York Post can try to convince me.